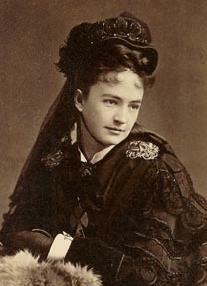 Libbie Custer is best known as wife to Lt. Colonel George Armstrong Custer, widowed when her husband was killed during the Battle of the Little Big Horn in 1876. <?xml:namespace prefix = u1 />Elizabeth Clift Bacon was born in Monroe, Michigan on April 8, 1842, to wealthy and influential Judge Daniel Stanton Bacon and Eleanor Sophia Page. As the only one of the judge's children that would live to adulthood, her father doted on her. At 5' 4" tall with chestnut brown hair and blue-grey eyes, Elizabeth was talented, beautiful and intelligent. Her father hoped she would make a good marriage with a man from her own elevated social class. Elizabeth graduated as valedictorian from the Young Ladies' Seminary and Collegiate Institute in Monroe. She met her future husband at a Thanksgiving social in 1862 in the midst of the Civil War. She fell deeply in love with him but her father refused to allow them to get married. Custer was from a poor undistinguished family and the Judge hoped Libbie would have better than the life of an army wife. After Custer was promoted to Brevet Brigadier General, Judge Bacon finally relented and they were married on February 9, 1864 in the First Presbyterian Church in Monroe. Libbie Custer accompanied her husband riding in the ranks everywhere he was stationed: from the front lines in Virginia - where he became a Major General - to postwar assignments in Texas, Fort Riley, Kansas: and Fort Lincoln in Dakota Territory. But as "first lady" of the army's Fort Lincoln, she set the social tone for the post. She hosted multiple events for the officers and area dignitaries. She was quickly assigned the title Mrs. Major-General, which in a letter to her husband she claimed that it made her sound "stuck-up" but she quickly dismissed it as knowing that George would prevent her from becoming so. Although Elizabeth lived fifty-seven years after her husband's death, she kept her marriage vows, fulfilling what she believed were her responsibilities as "the widow of a national hero" by lecturing around the world. 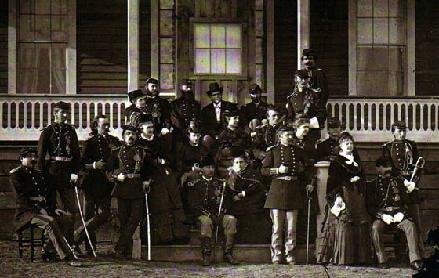 Known throughout her life for her undying devotion to her husband, she was the only officer's wife to live in a tent on the edges of the Civil War battlefield, ride in the ranks with the soldiers, and accompany the 7th Cavalry on many of its expeditions. 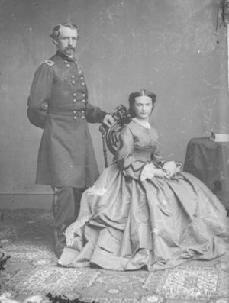 During those adventures, she wore her own uniformed dresses to show her dedication to her husband and the US Army. Forever a heated topic for debate, the controversy of George Armstrong Custer and his influence on the West fueled Libbie Custer's efforts to author three books on her husband's military career and her lifelong mission to counter the claim by then US President Ulysses S. Grant the defeat at Little Big Horn was solely due to Custer's leadership. Her three books, Boots and Saddles, (1885), Following the Guidon (1890); and Tenting on the Plains, (1893) were brilliant pieces of propaganda aimed at glorifying her dead husband�s memory. However she did not limit her publications to her husband and his military career. In 1900, she authored the children's story "The Kid" which was published in the St Nicholas Magazine, complete with illustrations. She died just days short of her 91st birthday on April 6, 1933 in her home in New York City. She is buried next to her husband at West Point Military Academy in New York.